Tue., Dec. 4, 2018, 8:52 a.m.
NASSAU, Bahamas – Three victories in three countries against fields large and small, strong and weak, couldn’t make Jon Rahm’s year any better. Nothing could top one win that offered no money, no world ranking points or even a trophy to call his own. He beat Tiger Woods in the Ryder Cup. “I don’t think there’s anything I can do in the game anytime soon that’s going to mean more than that,” Rahm said. When he spoke late Sunday afternoon after a four-shot victory in the Bahamas, the Masters was still 130 days away. That’s the next major, and majors are the greatest achievement for any player. Rahm is no exception. But yes, that Ryder Cup was special. If his tears that Sunday at Le Golf National didn’t show that, Rahm spoke for just over 4 minutes and used 638 words to explain. “I saw him win a great deal of events, grew up with a dream of someday beating him, and to do it on the Sunday or a Ryder Cup … it was extremely special,” he said. Seve Ballesteros inspired him, and still does. Woods motivated the 24-year-old Spaniard, as he did for so many other young players from Rahm’s generation. He studied Woods, including a recent documentary for the British Open that helped on Sunday at Albany. “He said once he got in the lead, his goal was to never go back to the field, to have the field catch him,” Rahm said. That wasn’t the only film Rahm has watched. He says he probably has seen every video on Woods and Ballesteros that can be found on the internet. And that’s probably how his fiancee learned the game. And that brings him to Saturday night outside Paris. 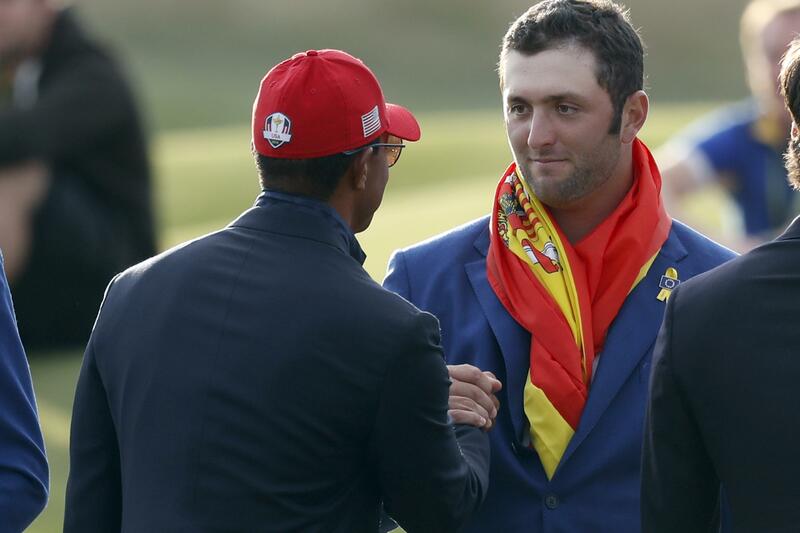 Europe had a 10-6 lead with Rahm contributing a point in his first Ryder Cup. “Kind of felt like I was letting the team down,” he said. Rahm knew he would be in the No. 4 spot for Europe, and then the U.S. lineup was revealed. He was expecting to see Woods toward the back because that’s where he had been the last two times he played, at No. 8 in Wales and No. 12 at Medinah. This time, Woods was at No. 4 against Rahm. “I’m like, ‘Great.’ To me, the greatest golfer of all time that I’ve been able to see, he just won at East Lake, he’s 0-3, I was 0-2. I’m like, ‘He really wants to win this, for sure, and I’m not playing my best.’ So that was my first train of thought,” Rahm said. He spent time that night and the next morning talking to his mental coach, European captain Thomas Bjorn and Tommy Fleetwood, who had experience playing Woods, including all three of Woods’ losses that week. He thought about a strategy, which turned out to be the easy part. Woods doesn’t make a lot of mistakes, so the Ryder Cup rookie better be close to flawless. The gallery was the largest on the course, and not because Rahm was playing. Turns out it was Woods who made the mistakes, with bogeys on the 13th and 14th holes to fall 2 down. Rahm missed a short putt on the 16th hole, giving him a 1-up lead with two to play. He responded with a shot into 5 feet on the 17th and a chance to close out his golfing idol. Rahm never lacks for emotions, and by now they were raging. He dropped his putter and lost his mind when the putt went in. He was screaming and hugging and forgot for a moment that Woods had walked across the green to congratulate him. That’s how much it meant to him, because that’s how much Woods means to him. Published: Dec. 4, 2018, 8:52 a.m.